Smoke rises from the Brigade Qaqaa headquarters, a former Libyan Army camp known as Camp 7 April, following clashes between rival militias at the Sawani road district, Aug. 24,2014. Libya’s U.N. ambassador Ibrahim Dabbashi warned Wednesday that his country could collapse into a “full blown civil war,” and he urged armed groups to halt hostilities and disarm. His remarks came as the Security Council adopted a resolution tightening an arms embargo and expanding sanctions to include militia leaders. The 15-nation council met to discuss Libya just days after its parliament – replaced in June – reconvened and chose an Islamist-backed deputy as the new prime minister. That left the country with two rival leaders and assemblies, each fronting armed factions. 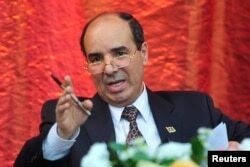 FILE - Libya's U.N. ambassador, Ibrahim Dabbashi, said he fears an all-out civil war. Dabbashi told the council that recent clashes among armed groups in the capital, Tripoli, and in eastern cities, including Benghazi, could send the country into a deeper conflict. “You are not unaware that the situation in Libya is complicated, and yet this situation since July 13 has become even more complicated, and the situation might unravel into a full blown civil war if we are not very careful and wise in our actions, and that needs to be true of all parties,” he said. At least seven people were killed and all flights were halted when heavy fighting broke out on July 13 between rival militias vying for control of Libya's main airport in the capital, Tripoli. Dabbashi said, "I had always excluded the possibility of civil war, but the situation has changed." "In the past, security incidents were limited, isolated and rare," he added. "But today the clashes that took place around Tripoli ... [were] between two armed groups using heavy weaponry. Each group had its own allies scattered in the other regions of the country." Further complicating the situation, U.S. officials said this week that Egypt and the United Arab Emirates launched airstrikes against Islamic militants in Tripoli. Ambassador Dabbashi did not mention the airstrikes, but reporters asked the U.N.’s top envoy in Libya about them. Tarek Mitri said he had no means of confirming the reports, but noted that there had been no clear denial. "The threat from the spread of terrorist groups has become real," he said. "At present, the chaotic security situation and the very limited capacity of the government to counter this threat may well have created a fertile ground for a mounting danger in Libya and beyond." He said the fighting has displaced more than 100,000 Libyans and another 150,000 have left the country. The U.N. mission also has temporarily moved its international staff to neighboring Tunisia until the security situation calms down. Most countries have evacuated their nationals and diplomats from Libya in recent months. An election was held in June in an attempt to rebuild state institutions and quell the violence that has spread since the August 2011 ouster of long-time ruler Moammar Gadhafi, who was fatally wounded that October. During the meeting, the Security Council unanimously adopted a resolution calling on all parties to agree to an immediate cease-fire and engage in an inclusive Libyan-led political dialogue. The Council also strengthened an existing arms embargo and expanded sanctions to target individuals and entities destabilizing the country and obstructing its political transition. Libya's government has called for a U.N. peacekeeping force to be deployed to help disarm militant groups and restore stability. But council diplomats say the situation is too volatile for peacekeepers.